Why is it that children behave one way with one parent and differently with another? Because, parents behave differently and children quickly learn what “works” with one parent and not the other. They learn which parent they can manipulate and which one they can’t. So, what is the difference between what these parents do when they both want to use Positive Discipline? Parents sometimes believe that giving children what they want and not burdening them with rules will show them that they are loved. We want to stress that permissiveness is not the way to help children develop initiative—or any other valuable social or life skill. If you say it, mean it, and if you mean it, follow through. Children know when you mean what you say and when you don’t. It is really that simple. Say it; mean it; and follow-through. Parents who say what they mean and mean what they say do not have to use a lot of words. In fact, the fewer words used, the better. When you use a lot of words you are lecturing and children tune out lectures. One reason you may use a lot of words is that you are trying to convince yourself, as well as your child, that what you want is okay. If what you are asking is reasonable, have confidence in your request. Some parents lack confidence because they feel guilty. They are afraid their poor little darling will suffer trauma for the rest of his life if his every desire is not met. Children will suffer much more throughout their lives if they develop the belief that love means others should take care of them and give them whatever they want. They will suffer when they don’t learn they can survive disappointments in life—and discover how capable they are in the process. 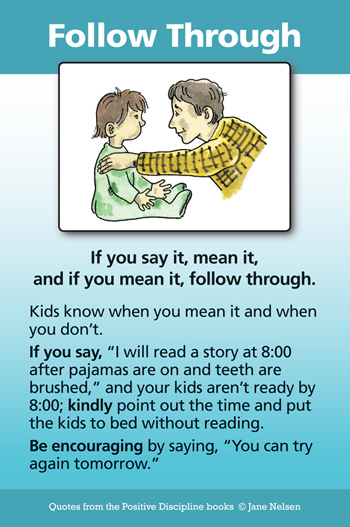 Many parents and teachers use the phrase "I’ve told you a hundred times." They need to realize that it is not the children who are slow learners. Children know what works for them. Adults need to accept that telling a hundred times is not effective. Children will never learn to be responsible for their own behavior as long as adults take that responsibility away from them by repeating reminders or by solving problems for them, rather than with them. Mrs. Silvester had told her children a hundred times to pick up their toys. After learning these concepts she kindly let her children know that from now on if they didn’t pick up their toys, she would. She added, however, that if she picked them up, she would put the toys away until they could demonstrate that they would take care of them. Mrs. Silvester soon learned which toys her children really cared about and which ones were results of her problem of buying too many toys. When toys were left out, she would say only once, "Do you want to pick up your toys or do you want me to?" Once her children knew she would follow through, they picked up the ones they cared about. When all the toys the children did not want had been put up, Mrs. Silvester told her children she would no longer warn them, but would just pick up any toys that had not been put away. She did not have to pick up many toys as the children scrambled to beat her to it. When her children asked for toys she had put away, she would give them back only after they had kept their toys picked up for a week. She got the children involved in taking the rest to a thrift store. “Not too long ago, my daughter knew she could get away with very little with her father. She went to bed for him like a Saint. When it came to me, she knew she could push me to the ends of the earth, and get whatever she wanted, even if the whole experience was negative. We spent hours, at night with her making requests such as, rub my back, put cream on my leg, fix my blankets—all just part of a power trip she was taking me on. I felt guilty and so I continued the long and drawn-out bed times that left me exhausted and unable to finish my nightly duties. Since reading the Positive Discipline books, I learned that much of her self-worth comes from doing things for herself, and feeling accomplished. That opened my eyes. I cut out all the special services knowing she can do things herself, and it was my job to encourage her to do so.